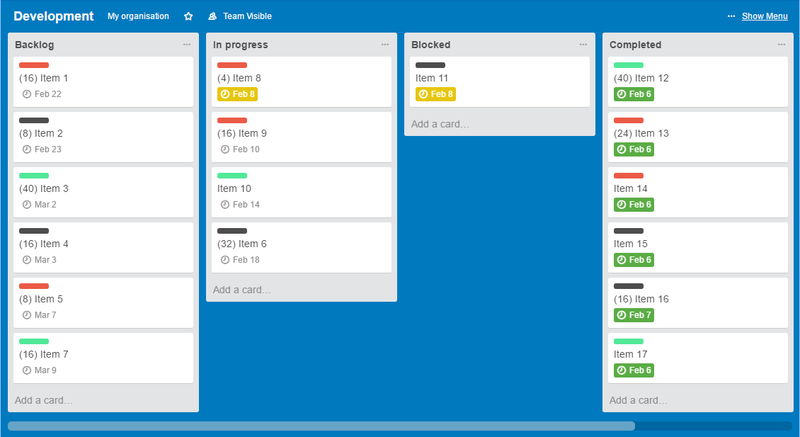 We'll use an example scrum board in Trello as an example on how you can set up progress and effort/duration tracking in Placker. The board is a simple scrum layout with four lists for backlog items, items that are in progress, blocked and completed. The board is called 'Development' and shown in the picture below. Cards move from 'Backlog' to 'In progress' when they are started, then they move to straight to 'Completed' when they are done or they can be moved to be 'Blocked' list. As this board tracks the progress of the cards by moving from list to list, progress tracking of this board will be set to 'by list' during the import of the board. This way, every time a card moves from list to list, the progress status and progress dates are automatically updated in Placker. The import process and setting process tracking by list are shown in the below screen recording. You can use the title to set the effort attribute in parenthesis, and you can use the effort to set the duration of the cards. On the example board, the effort is tracked in this way, so, for instance, a title "(16) task 1" would indicate this card has an effort of 16 hours. Select 'Effort' at "Which attribute do you want to track in the card title?" The default value is set to 8 in this example. In the screen recording below you see how to set this up. Then, the next step is to use the effort to set the timeline of the cards in the Gantt, by default the duration attribute of the card is used, you can also use the effort. When you do this, it will show an effort of 8 hours as 1 day, and an effort of 16 hours as 2 days. (if you like you can set effort by work days instead of hours). Open the more settings panel in the Gantt chart. Go to 'Effort/Duration' settings, and select effort as the duration attribute. Now, when the effort is updated on the card, also the duration is updated on the Gantt, or when the duration is updated on the Gantt, the effort gets updated as well. With this configuration, you only need to include the effort in parenthesis in Trello to set it in Placker.